Michelle has seen many people who are experts at what they do go unnoticed because they don’t have a professional LinkedIn profile. It frustrates Michelle because these people are great at what they do, but nobody can tell that by their profile. That’s why she loves working with entrepreneurs and small businesses because she can show business owners how to grow their presence on LinkedIn and get more income. Here is a video in which Michelle briefly describes her presentation. 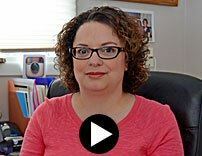 Michelle Arbore is the Owner of Savvy Social Media, where she helps entrepreneurs and small businesses move past the overwhelm and frustration of social media. Her company offers social media creation, management and coaching so you can live the life you want. She takes you through each step with ease and simplification so you understand this ever changing social media world. Because of that, Michelle's clients have more time to work on their business and meet new clients, as well as spend more time with the people they love. With being a successful business owner and mom, Michelle understands the value of time and it empowers her to give you back yours.